The USA Pavilion at the world’s fair in Milan. The mile-long Decumanus is the fair’s main fairway. 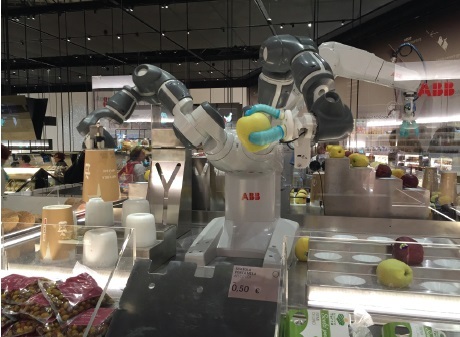 Robots sorting apples in Supermercato del Futuro. The “selfie” makes a perfect metaphor for a world’s fair: an event where the nations of Earth gather to show off what they know, and who they’re with—all with the idea of promoting a new self-image. 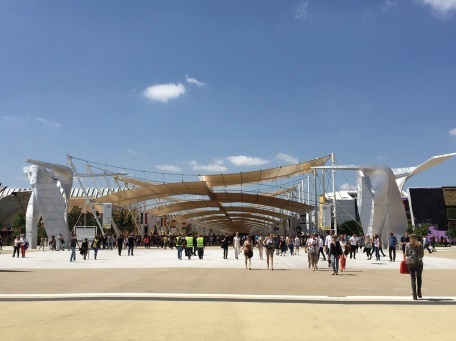 It’s more than a metaphor in Milan at Expo 2015. Here, world’s fair visitors take selfies with pavilion staffers in exotic Arab robes or next to mascots in the shape of giant tomatoes. A bronze sculpture of a man sitting on a bench on the Expo’s main concourse is specifically designed with an open seat where visitors are encouraged to plop down and snap a “foto o selfie.” A fast-food vendor, James Bint Belgian Fries—a tasty successor to the famed Belgian waffles of the 1960s—encourages customers to take selfies with the company’s posters. Even Milan’s daily newspaper, Corriere della Sera, advertises itself at the fair on a large flat screen with images of Italians taking pictures of themselves. Selfies aren’t just self-promotion, they are content. It works because fairs have become more digital, not simply as showcases for high-tech 4D multimedia experiences, but because fully experiencing a fair nowadays involves having a digital relationship to it. Everyone carries a smartphone now—a far cry from fairs in the ‘90s where cutting-edge exhibitors offered Internet cafes where guests could send an email—an actual email!—home. Young schoolchildren, who are legion in groups at the Milan fair, have smartphones and often rush up to an exhibit of, say, ancient cultural artifacts, snap innumerable pictures and move off without having looked at the actual objects. The digital, wireless revolution that puts such powerful devices as an iPhone in our hands has become the way fairs are seen, processed and remembered by millions. A symptom of the transition to digital: Milan’s is the first expo in my memory that does not have a post office on-site. Postcards are rapidly becoming a thing of the past, and expo stamps for collectors only. Still, the fair itself exists in the analog world—imaginative architecture, beautiful landscaping, vast and crowded spaces. The Milan fair is located on nearly 250 acres of land in the transition zone of industrial to agricultural on the edge of the city. At one end is urban Milan, on the other the fertile Po Valley, source of much of Italy’s agricultural production. A Metro subway line speeds visitors to the expo in 20 minutes from the city center. The expo’s layout consists of an east-west street called the Decumanus, a road about a mile long lined with scores of pavilions and covered by canvas to protect against the sun and elements. A cross street about two-thirds of the way along called the Cardo provides north-south access and a main piazza—the road arrangement is taken from the standard of old Roman cities. The result is a kind of broad market street for the visiting pedestrian hordes. The theme of the fair is “Feeding the Planet: Energy for Life,” and who could resist a world’s fair in Italy on the subject of food? The Expo delivers on its topic in interesting ways. With over 100 countries participating, the issues of hunger, global warming, water and the food chain are front and center, and can be experienced in numerous ways—from elaborate pavilion exhibits to tasty street food. 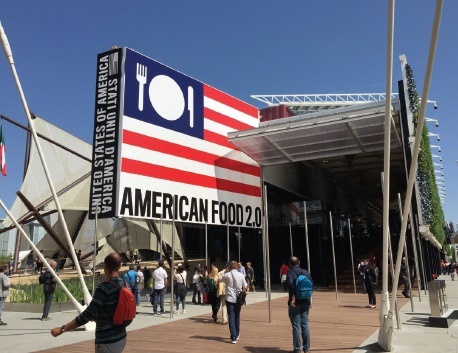 The United States pavilion, under the auspices of the James Beard Foundation, offers a look at America’s regional cuisine. Guest chefs, including Seattle’s Maria Hines of Tilth and Naomi Pomeroy of Beast in Portland, are scheduled to cook not on the fairgrounds but in Milan’s original mall, the glorious Galleria Vittorio Emanuele II. On the fairgrounds near the American pavilion is the so-called Food Truck Nation, a popular court filled with pseudo-food trucks hawking American barbecue and burgers. There’s nothing that seems so American as linking fast food with big vehicles. Other nations have terrific restaurants attached to pavilions that seem designed to lure you in. During my days at the fair, I sampled bitterballen from Holland and fish balls from Oman, Belgian fries and fiery Indonesian satay, lamb tagine from Morocco and japchae and mushroom porridge from Korea. The South Korean pavilion is a shrine to kimchi—a centerpiece is a giant kimchi jug. At the end of the exhibit is a first-class restaurant featuring Korean specialties, and a long wait to get in. The Eataly Italian food court features specialties from every Italian region—octopus with potatoes from Liguria. Yum. Oh, and the vodka gelato from Belarus hits the spot on a hot day. This fair clusters some nations by the foods they export: chocolate, rice, legumes, tubers. And coffee. Milan happens to be the city whose espresso cafes inspired Howard Schultz to turn Starbucks from a coffee-bean retailer to an international purveyor of lattes. An Expo visit must be powered by caffeine, and grounds are readily available on the fairgrounds. Selfies cannot replace the experience of eating, but somehow taking pictures of what you ingest and posting them to Facebook or Instagram is an integral part of the experience, feeding an endless appetite for images. The Japan pavilion is an impressionistic exhibit that takes you through virtual experiences, like wading through a digital rice paddy. But it ends in another place where the digital and analog meet. In a circular performance theater showcasing what they call the “Restaurant of the Future,” visitors sit at tabletops with built-in digital screens that act as in-depth menus telling you what fresh foods are available, where they are sourced and what to eat by season. Visitors are taught to use chopsticks, then instructed to tap their screens to “order” a seasonal meal. If nothing else, the interactive menus do a better job of selling sushi than those small plastic replicas of the rice and fish concoctions so often seen in sushi parlors in Japan. But the message is: digital is a means to an analog end. The same message appears in another pavilion featuring the “Supermercato del Futuro,” a vast, Whole Foods-like emporium, but better organized. Gone are clerks. A robot sorts apples, and by merely waving a hand over an item—oranges or prosciutto—you activate an electronic display of price and sourcing information. You wonder, why do we rely on cramped food packaging with micro-typography to tell us what we’re buying? In contrast, the fair’s Slow Food pavilion, here at the birthplace of the movement in a country where every town insists its own specialties are the best in Italy, comes in a re-usable hand-built wooden structure set up like a farmer’s market with artisanal suppliers leading you through tastings of cheese and “slow wine.” The contrast in styles is reflected all up and down the food chain: small and local versus big and corporate. Both have their virtues, and downsides. Crop diversity, sustainability, local knowledge and adaptation are keys to the future; so is figuring out how to keep the planet efficiently watered and fed, with advances in science and technology. Attendees range from a global colossus like Coca Cola with a peppy pavilion featuring Pharell William’s song “Happy”—ideally suited to the kind of Coke commercial optimism world’s fairs like to promote—to guests like environmental activist Vandana Shiva, whose Expo appearance was accompanied by a media scrum worthy of a Kardashian. Some ask, why not make world’s fairs digital? Americans tend to think that expos are passé; the last held in North America was in Vancouver in 1986. Yet despite digitization, the fairs thrive around the world. Why? One reason is that you can appreciate a plate of polenta and sausage online, but you can’t eat it there. Fairs are feasts for the senses, for human interaction. They are temporary cities with all the virtues of urban life—activity, diversity, and community—yet few of their workaday headaches. At their best fairs spark the imagination and hope. At their worst, they’re ephemeral, superficial and propagandistic. They are temporary, real-world fantasy worlds. They are also full of surprises. I think of a world’s fair as a high-tech alternative to the Amazon model writ large. Amazon is brilliant for helping you buy what you know you want. World’s fairs, like good bookstores, are great at introducing you to stuff that you never knew you wanted, or wanted to know. I learned, for example, that the cherry tomato was an Israeli invention and that drip irrigation might help save the planet. I learned that Uruguay is gay-friendly. I discovered that cultivated apples originated in the Tien Shan mountains of Kazakhstan. I also learned the Kazakhs drink horse milk for its special nutritional and healing properties, but I still passed on the horsemeat salad offered in their restaurant. Perhaps I’ll get my courage up to try it at their upcoming Expo slated for 2017 in Astana.